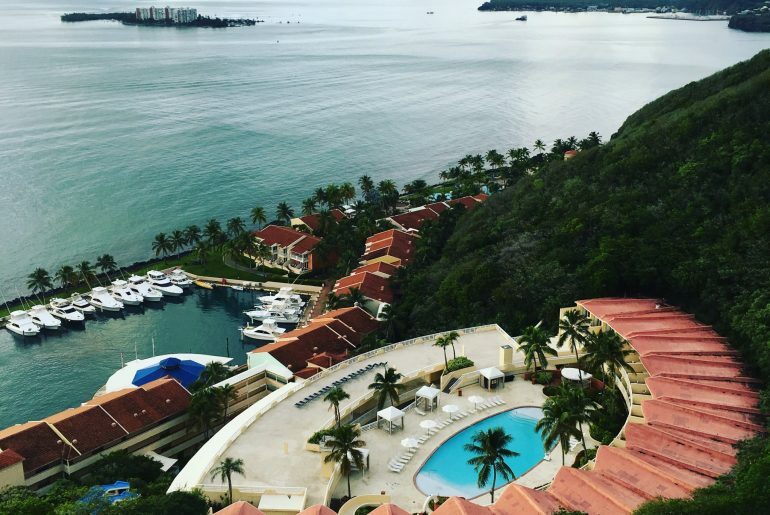 The view from my window at the gorgeous El Conquistador Resort in Fajardo, Puerto Rico. Barefoot, I silently walked along the narrow muddy path, barely illuminated by a cloud-shadowed moon. The only sound was the distant roar of the ocean, far below. 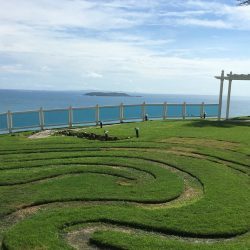 Our group of women was walking the labyrinth, clasping a piece of paper we were to put into a small flame when we reached the center. On it was written something we wanted to let go of. My piece of paper took a bit of coercion to light and a second attempt to get it to fully burn. A perfect metaphor for how hard it can be to let go of negative factors or thoughts in our lives. 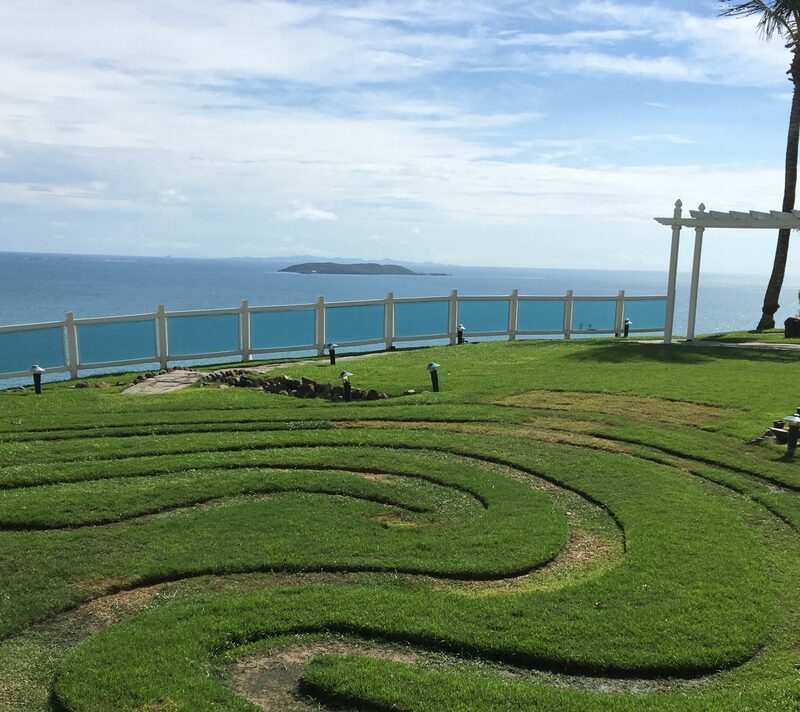 That exercise at the Starlight Labyrinth Meditation was one part of what we were here to do at a Wellness Retreat at El Conquistador Resort in Fajardo, Puerto Rico. 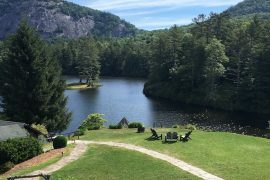 These customized three-night retreats are aimed at achieving balance for our bodies and our minds. I did my best to push my body during the many and varied exercise classes and physical activities, while letting go of negative thoughts and energy. I would discover there is such a thing as pushing your body too far and letting go of negative energy can be one of the hardest exercises of all. One of our activities was to walk the labyrinth at night, with the sound of crashing waves for our soundtrack. Guests choose from one of the four element options for their retreat — earth, fire, water or air — and meet with the instructors to customize their experience. 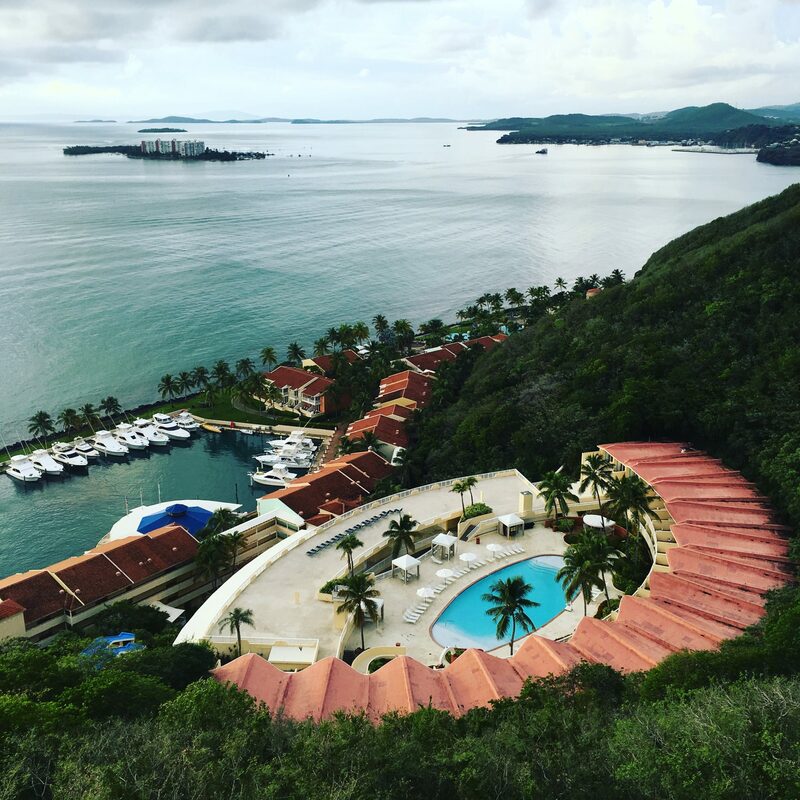 Our retreat focused on earth, which includes twilight yoga, a hike in the El rainforest, a climb up Palomino Mountain, a raw foods lunch and learn, an 80-minute rainforest hot stone massage and four optional fitness classes. The first exercise class was a Bosu Boot Camp in the Waldorf Astoria Spa on the property. I’d never heard of Bosu, but was soon to make the acquaintance of the bouncy half-mooned shape that we stepped on and off and lifted over our heads as we ran around the room. It’s the kind of activity that would make you feel like an idiot except you have eight other people doing the same thing, so they are hardly in a position to laugh at you. That afternoon we took a ferry over to the resort’s private island, Palomino Island, for an invigorating walk to the top of the mountain for spectacular views. That was followed by a raw foods lunch and learn where we rolled coconut energy balls, super sweet-tasting despite the lack of any sugar, and watched Chef Lydia Feliciano make delicious coconut ice cream with dry ice. Sadly, my body cried, “No more” as my right knee swelled and throbbed in protest after the morning class and afternoon hike. It was back to my room with an ice pack for awhile. Regretfully, but respecting my limits, I opted out of the full moon yoga class, but observed for a while as the women stretched in the soft moonlight, offering a silent prayer I’d be well enough the next day for the hike in the rainforest. Our meals were delicious and beautifully presented. My favorite was this ahi tuna salad. My prayers, ice pack and Aleve did the trick and the next day we set off to hike in the El Yunque Rainforest, the only tropical rainforest in the national park system, where it rains 156 days out of the year in the 28,000-acre forest. This day was no exception. Right when we reached the scenic waterfall, our first stop, the sky opened up and didn’t let up for the remainder of the hike. I had a decision to make. I desperately wanted to edge my way over the rocks in the shallow pool to bask in the area right below the waterfall and splash in its healing waters. But thoughts of stepping wrong on the hidden, slippery rocks, throwing my knee out and managing the 470 steps we had yet to cover kept me seated on the rock. I resisted the pity party — another activity to let go of in my life — and counted my blessings to be in this sacred place at all. I instead took the time to take the guide up on his offer to give me a mud tattoo on my arm. Balancing an umbrella with one arm to shelter him, I stuck my arm outside my poncho for him to use a stick to draw a lizard on my forearm. Although it quickly washed away in the drenching rains, it made me smile. Perhaps a metaphor for life’s troubles, right? This, too, shall wash away. Perhaps it wasn’t advisable, but I couldn’t resist joining in a dance class that afternoon back at the resort, my knee tightly wrapped in a bandage. I took it easy, with my salsa steps less spicy than usual, but my heart was uplifted as always when I dance. Any sore muscles or lingering chill I was harboring from the damp hike in the rainforest were gloriously dissipated by the 80-minute rainforest hot stone massage. No need to push any limits, or let go of anything except stress during this lovely, soothing treatment. For our last exercise class, we jumped in the warm waters of the El Conquistador’s main pool early the next day for an Aqua Parkour class created and taught by Rita Maldonado. She doled out black webbed gloves to increase our water resistance and class began. We stretched, we swam, we jumped, and our heart rates soared as we pushed ourselves in the swirling waters we created with our motions. 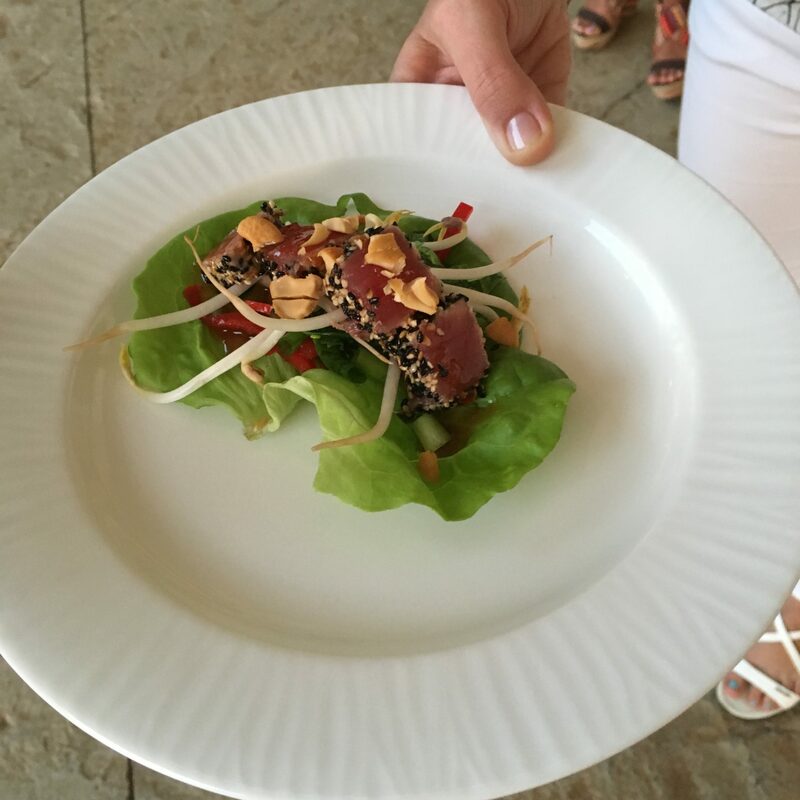 To fuel our activities, we dined at several of the restaurants and outdoor locations on the 500-acre resort, with our meals designed to mirror the goals of our wellness retreat with an emphasis on healthy food. Portions were smaller, alcohol was minimal, but the results were delicious and beautifully presented. My favorite dishes were fresh lettuce topped with bean sprouts, red peppers, cashews, sweet chili sauce and freshly seared tuna; and packed with flavor breakfast taco. 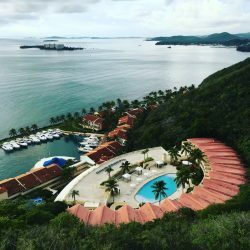 At night, I crawled into bed in my spectacular oceanfront hotel room, which had a large balcony and view of the marina below from atop the 300-foot bluff where the resort is situated. My favorite feature was the L-shaped couch where I could lounge and view the ocean outside, right at the spot on Puerto Rico where the Atlantic and the Caribbean meet. I could see all four elements at once – the fiery bright Puerto Rican sun, the lush green earth, the swirling ocean, and the breeze blowing through the trees. 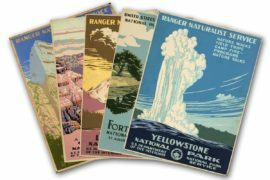 • Single occupancy rates start at $1,600; double at $1,475.